District Legal Services Authority, Jorhat Recruitment 2017- 50 Nos. of Para-Legal Volunteers (PLV) Vacancies. - Jobs4NE : Jobs in Assam and North East India. 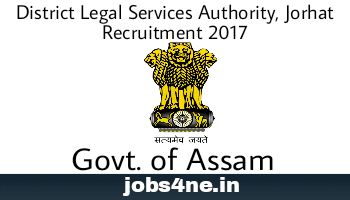 District Legal Services Authority, Jorhat Recruitment 2017- 50 Nos. of Para-Legal Volunteers (PLV) Vacancies. Applications in Standard form are invited from Local Indian citizens for selection of around 50 numbers of Para-Legal Volunteers (PLV) in Jorhat and Majuli District under District Legal Services Authority, Jorhat, Assam. Last date for receiving of application: 31-07-2017. Job Location: Jorhat & Majuli, Assam. Name of the post: Para-Legal Volunteers (PLV). Total no. of post: 50 Nos. Age Limit: Applicant age should be minimum 21 years as on the date of application. Remuneration: Fixed by District Legal Services Authority, Jorhat. How to Apply: Application in standard form along with 2 (two) copies of passport size photograph to be sent to the Office of the Secretary, District Legal Services Authority, Jorhat on or before 31-07-2017. The applicants must provide their Mobile/ Contact number in their applications for further required communications.